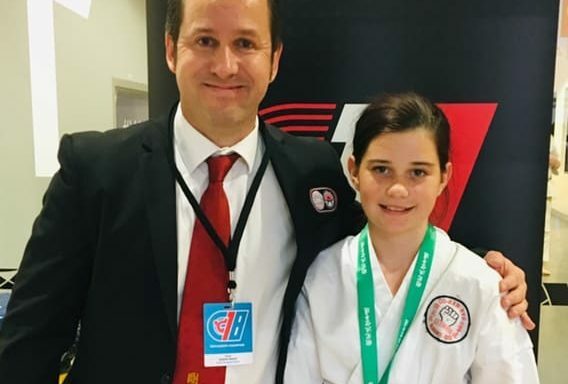 As a Rising Star recipient, Abigail Potter had the opportunity to attend the GKR Karate National Championships in Wantirna, Melbourne. She competed in both Kata and Kumite in the 12 to 13yrs age group against six other girls. In the Kata, Abigail was unsuccessful in placing but gave her all in the Kumite. The other competitors were hard and fast in the sparring section (Kumite) and all had their eye on the same goal of placing. Luckily, Abigail’s hard-fought matches landed her a bronze medal for her age group. GKR Karate started in 1984 and by the year 2000, had over 15,000 students. The association promotes discipline, confidence, character development and inner security. Abigail is one young athlete to watch in her pursuit of Karate in the years to come. Caboolture Sports Club congratulates Abigail on her bronze medal at Nationals and looks forward to what the future holds for this young athlete.